Danny Vitale shot out of his break, spinning his head around to track the football. He tapped his toes just before the sideline and lunged his arms out, reaching for another fingertip grab. Too far. That one got away from him. He shook his head as he got back in line with the other two prospects. Shrugged it off. Then he grinned. It wouldn’t affect the rest of his routes that day. As he repeatedly plucked balls out of the air, Tampa Bay Buccaneers tight end coach Jon Embree praised his crisp route running. Vitale seemed to know how Northwestern’s pro day would go before he even stepped out on the Nicolet Football Center field. Head coach Pat Fitzgerald pointed out that Vitale’s blocking ability is probably his most underrated skill, but he recognized the “superback” could do much more than just stuff would-be tacklers. 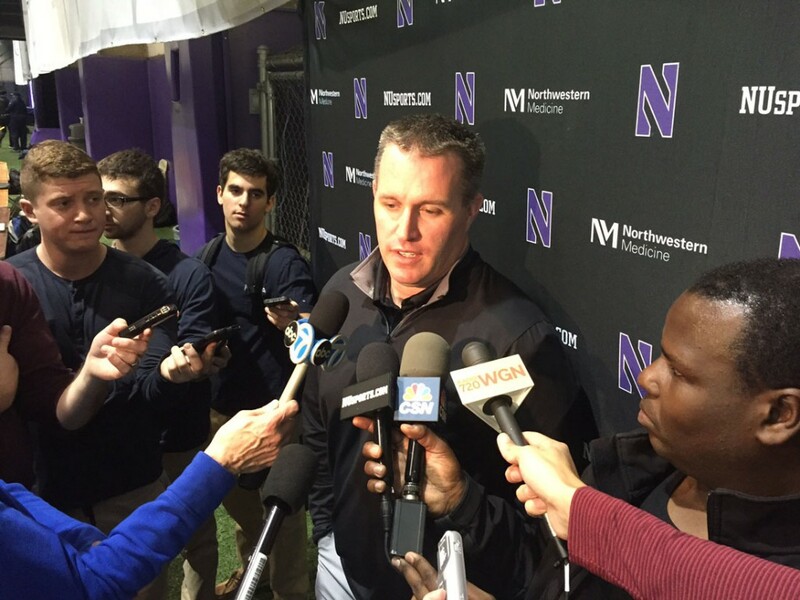 Northwestern head coach Pat Fitzgerald talks to media about Vitale (Tolly Taylor/MEDILL). Fittingly, the Buccaneers tight end coach worked out Vitale, talking through drills in less than a minute and then expecting Vitale and the two other prospects to run them. Whatever Vitale is doing at TCBOOST in Northbrook, it seems to be working. Vitale didn’t repeat any of the NFL Combine drills, despite admitting that he wanted another shot at the three-cone drill. But the former “superback” looked to be the quickest, cleanest route runner of the two tight ends he competed against. And he knew it. Even if some teams don’t see him as a tight end, Vitale is confident NFL scouts now know what makes him special at fullback. He better hurry. He’ll have less than a week before his first private NFL team workout, a Monday 10:30 a.m. session with the Buccaneers running backs coach Tim Spencer in Evanston. “I’m not sure how long it is or what to expect,” Vitale said. Photo at top: Northwestern’s Danny Vitale warms up before his pro day (Tolly Taylor/MEDILL).